Here at The Information Lab we work with a very wide range of different customers; large and small organisations, Tableau beginners and accomplished users, and across many different industries. We have had the privilege of seeing and helping construct some really great output from using Tableau and, well, some of the not-so-great. People often get stuck with Tableau because they’re trying to do something it is just not designed to do. This might be because they are used to using other BI / MI tools and don’t know any other way, or because they don’t fully understand the implications of what they’re asking the software to do. Here are my top 5 popular things I see people trying to do in Tableau that you should avoid! or even impossible in Tableau. Excel has been designed differently to Tableau. It works in a different way and has different strengths and weaknesses. Instead of trying to replicate the report/chart/table, write down the purpose of it – what questions does it try to answer? Then redesign in Tableau to answer those questions whilst playing to Tableau’s strengths (dashboard drilldown functionality, visual data exploration etc.) You’ll probably find that you can answer a whole lot more too! So you need to perform some analysis and create a Tableau dashboard tool that many people across your organisation can use. Some users will be managers or execs who want a high level summary view and others will be sales people who want to see the detail for their particular area. Some people try to tackle this problem by trying to design a “one size fits all” solution where all the data is presented in a huge table complete with multiple levels of subtotals for the different aggregations, or a combination of tables and charts where a user then filters down to the slice they want to see. This is a bad idea for two main reasons. Many traditional BI tools do this and you end up with a “one size fits no-one” solution. Instead, aim to build interactive views which take a user from high level aggregations down to the detail in chunks – allow them to visually explore the aggregations and allow them to select areas of interest through dashboard actions, perhaps even splitting your report over multiple dashboards. This leads to a much more holistic understanding AND solves any issues surrounding displaying too much info on one screen. So you have a database and all the relationships between the tables have been set up correctly by your DBA… now it’s time to bring the data to life in Tableau! You know that your dashboards will require data from all the tables so the best thing to do is to create a connection using the Multiple Tables option and connect up every single table, right? [BZZTT!] Wrong! Unless your database is a simple, single-fact star schema then connecting every table up is a sure-fire way to get into a huge mess. Creating a query involving multiple fact tables will likely end up with lots of duplicate records (sometimes called a “Chasm trap”) which will result in weird results or slow performance or both. Two bits of advice here. First, start slowly. Connect to one table, look at the set of results, verify they’re what you expect and then go back to the connection window and bring in some more dimension tables. If your number of records suddenly goes up ten-fold, don’t add that table in the same query. 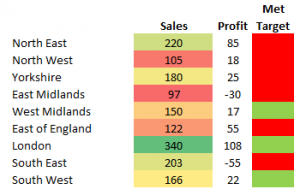 “But I need that table in my analysis” I hear you say… onto piece of advice number two; create a separate connection using your other tables and combine them together in Tableau using blending. Tableau is the number one tool for quick fire analysis, building interactive visualisations, and decision support through data discovery. You really can get to the data you need to answer your business questions in breakneck speeds! Much of the time though you’ll also be creating reports for others to consume through Tableau Server and you may have to conform to some corporate design recommendations – e.g. using a custom font and a certain combination of colours etc. This is fine and Tableau understands and supports this through a variety of dashboard objects, controls and formatting options. But please don’t get too hung up on the exact layout of your report – Tableau is not for “pixel-perfect” reporting – e.g. I wouldn’t use Tableau for printing tax forms and I wouldn’t use Tableau to make sure the corporate logo is always 38px from the far right of the dashboard header. One of this things I teach in training sessions is how to connect to your data, and what your data should ideally look like so that Tableau can make the most of it. Tableau have a great article on their site explaining that Tableau wants to connect to a RAW data format, rather than data that has been pivoted or entered into a summary table with subtotals and line breaks etc. Although this is a natural way for a human to read data, it is not natural for a machine and you’ll want to pay special attention to this when first bringing data into Tableau. One client asked how he should structure his various Excel tabs so that they could be analysed together. When I looked at the data, there was one tab showing aggregated sales per region, one showing sales per year, one per employee etc etc. When I showed him that connecting Tableau to the raw, un-summarised, data table was a much simpler way to slice and dice all the different dimensions he saw the light – feed Tableau raw data! That’s it, my top 5 common things I try and steer people away from and the vast majority of the time its simply because they just haven’t thought about doing it differently! If you have any questions about these points or want to talk about Tableau in general, please get in touch at info@theinformationlab.co.uk or why not subscribe to our newsletter? The link is on our home page! I do agree that a lot of time can be spent formatting, but that is arguably a weakness of the current software: why can the user not set his own default fonts, for example? Your own example of ensuring that a logo is a certain distance away from a header is also an interesting one. With Tableau 8, they have built a version that specifically allows you to be absolutely accurate. Should we be spending time being so accurate? If my team is building reports and wants to build a brand around these reports, then such consistency is part of the bigger picture: “our reports are consistently well produced, our data is consistently accurate”. Mike, I agree that formatting can be fiddly and that the devs have some way to go here with regards to setting default fonts and wotnot. I hope we can see further improvements in future versions… have you seen the ideas forum on Tableau’s site? It’s worth up-voting some of the formatting suggestions there to ensure Tableau know what’s important to users – they use the results of that forum to steer development spend! Hi Robin – thanks for the reply. Yes, I have been up-voting and adding some ideas fairly regularly. I should say that I think the article makes some good points, so I just highlighted the one I most disagreed with. Whilst I am back here, I’d also question #1: I don’t entirely disagree, but in the context of reproducing an existing report in an entirely new piece of software, an end user of the report is going to feel pretty overwhelmed if his old report has both a new layout (different charts etc) and is in a new piece of software. Here’s another example: as a French teacher, good practice is to introduce new grammar using already known vocabulary, and vice versa. In this context, I think reproducing an existing report in Tableau can be a good way to bring change to the end user, so they feel comfortable on at least one level with their new report. I’m going to mostly agree with point #1 and add context. Customers might want to carry forward from Excel, etc., useless information into the new Tableau viz. Stephen Few spends some time on p. 62 of his book “Information Dashboard Design” discussing what really matters. The book is about dashboards, but the point applies to info graphics, reports, maps, and so on. If the Excel spreadsheet contains useless information, and the developer sees that it is useless, the developer has a professional obligation to work with the customer as a UX-empathetic; don’t carry forward useless information. If the developer doesn’t even identify the useless data and fails to engage the customer about it, the developer is hurting our field. Carrying forward of useless data creates visual debt. We did just this sort of thing at a large financial institution, in one specialized area of the firm. The exercize of moving prior SSRS reports into Tableau, and then, once we had completely mimicked the existing report, using Tableau to create new dashboards which could then be mixed in, was very powerful. One of the greatest aspects of Tableau is it’s intelligence regarding preferable methods of presenting data, so feeding Tableau some data and seeing what it does to present it, can be very rewarding. Also, as you imply, the process of imitation is darn good education on how to use the Tableau UI to achieve results. French is a good example to use for “Tableau” (a word with origins in France). And, you are spot on. Learn a language using simple concepts and “grow” from there. Fortunately Tableau lends itself to this “iterative” process very well. I agree Mike, one of the biggest features of Tableau is making beautiful visualizations, of which, formatting is an obvious focal point. I think the point here is you can get your insights w/o spending tons of time on formatting but for my dollar, an end-user will never see something I haven’t formatted to the nines. Regarding point 4, it’s difficult sometimes to know when enough is enough. An alternative in some instances is to consider the use of background images. Being able to float in Tableau 8 helps. I agree that templates would be immensely helpful. I’ll add that a template or profile should start with the size of the dashboard. Many other design decisions are made based on screen area and flow naturally from width and height. Regarding logos, I think it’s important that from tab to tab, the logo shouldn’t move. If it does, it distracts the customer’s eye. The customer only has so much attention. Don’t waste attention on moving logos. 1px, not noticeable. 5px is annoying. Aside from moving titles and logos, and a reason to get it right, is the proportions of negative and positive space. Get this wrong and people notice, they might not be able to tell you or identify it, but it’s an aesthetic quality. This can take away from an otherwise nice viz. An exercise with negative/positive space is to float titles on a map and place them next to the zoom controls. Some placements looks better than others, yet the difference is just a few pixels on either or both the x- or y-axes. We use this background image approach quite extensively. We have a set of ‘standard’ layouts with logos etc and boxes indicating the size and location of graphic elements. These are effectively full-size background images. We use this as the background and then float the graphics over the boxes. It gives quite exact control, especially of static elements. I wouldn’t get too hung up on point #4. Overall, this article is totally spot on! Having worked with hundreds of Tableau evaluations, these are some of the most common mistakes I see done over and over. The best advice I can give is to rank some of the business critical questions you have of your data and choose one or two, connect to those tables (not every table you may ever want to use ever), and use Tableau’s strengths to answer those questions in a new and elegant way. All the resources you need to get started are on Tableau’s learning page, I would recommend watching some of the getting started videos and if you have time, the weekly intro live training is a great jumping off point. This is a great article, but I would recommend further clarification on point #1. As I transition reports from Excel or other platforms to Tableau, the transition from raw data to visualizations is overwhelming to most users and they are hesitant to trust the new version until it is proven reliable in their own mind. If they have been used to seeing all records for years and visually eliminating irrelevant records, they will be hesitant to trust that the new report is not over looking potentially critical issues that they would have caught if given all the data. I have found that recreating an identical looking report on one tab, then an improved version implementing Tableau’s Best Practices on another, allows the user to toggle between the two as they are building trust and familiarity with the new style of reporting. Once confidence is built, the users will transition to the visual analytic tab, and the data tab can be deleted. Terrill and Everyone else concerned with Point #1, the Excel table with conditional formatting isn’t raw data, it’s one of the most powerful and fundamental data visualization conventions ever created. Scatter plots with color and shape are another mainstay of the data viz world, so it’s shocking that Tableau would neglect the former but embrace the latter. Without color & dependable, instant sorting, data validation & cleansing become extremely burdensome. Maybe quality assurance isn’t as glamorous as sales to Tableau developers, but those of us in the trenches clamor for tables with more than 16 columns and empowered with conditional formatting & sorting on every column. Yes, that would be like Excel, but isn’t that why Excel is still ubiquitous? It’s not hard to add Tableau magic to the bedrock functionality we’re all accustomed to–someone just finds it distasteful! Hi Robin! I realize this is a few years old at this point but this was an extremely informative post. For me, working through examples is the most effective way to learn. So, I took a few of these concepts and worked through them on my own to try and tackle some of the problems that beginners face (since I’m a beginner with Tableau myself!). I wrote up my notes and instructions at http://newprediction.com/tableau-beginner-mistakes/ if anyone is interested in taking a look. Feedback appreciated! 🙂 I have most of the examples covered here and a few more in depth videos as well. Trying to use Tableau as a financial statement report writer.